Not content with denying any responsibility for the continuing carnage in Iraq and beyond, and still dogged by acusations – notably from Desmond Tutu – of responsibility for war crimes, Tony Blair is now going the whole hog: he’s offering his services to the new Sri Lankan government. And exactly what are the ‘misconceptions about the country’ he’s offering to help the Sri Lankan authorities negate? Yes, like me you’ve probably guessed it folks: it’ll be all about war crimes allegations, chiefly those stemming from the final stages of the country’s civil war in 2009. Well at least our former Prime Minister knows plentry about the subject – especially how to face down and in particular avoid your critics (Chilcott Enquiry etc). Breathtakingly cynical – even by Blair’s own elevated standards in this department. 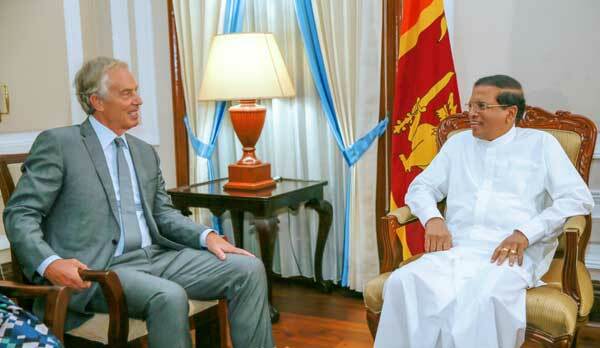 Former British Prime Minister Tony Blair, who is in Sri Lanka on a private visit, met President Maithripala Sirisena today and assured he would speak on behalf of Sri Lanka to help negate the misconceptions being spread about the country. He praised the President’s efforts at holding a peaceful parliamentary election and the work being done towards reconciliation.